Like everyone else, sure part of me is lusting for an iPad. As Fake Steve Jobs hilariously says, it’s probably that emptiness in my soul. But for now at least I’m holding off. As Greg Head tweeted, Apple’s V1’s are generally exciting but the products almost always become more full-featured and useful at V2 and beyond. 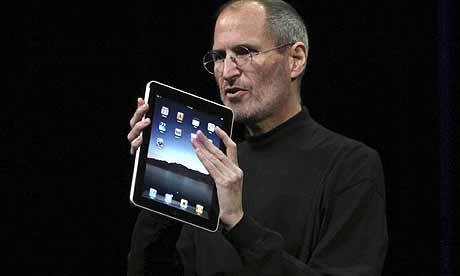 I don’t mind waiting for the next-generation iPad which I’d expect to be a much more well-rounded and robust product. I have zero interest in AT&T 3G on my iPad. If mobile becomes a need I’d rather – as Ray Wang is apparently doing – get a MiFi or similar device on whatever carrier I choose and use that in conjunction with the WiFi capabilities. Jeff Nolan wrote a very detailed & incisive post on the cost of content on the iPad and how the true costs of the device are much higher than the market will likely bear. I know that, for me at least, reading ‘publications’ such as the Wall Street Journal are potentially a major attraction of the iPad, but not at $5/issue or $17+/month which is simply insane.Early returns are indicating that Jeff and I are not the only people who feel that way. So for now, I’m trying to fill that hole in my soul in other ways (including my Nexus One which should continue to satiate my gadget lust for a while longer at least). I do look forward to hearing more about about how you all like your iPads. In the meantime, please try not to sneer at me when I take my Kindle out during my next flight.